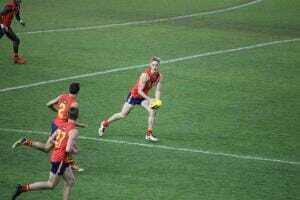 DRAFT ANALYSIS: "A ready-to-go midfield accumulator in the mould of the modern day prototype"
South Australia’s Jackson Hately is one of the most ready made players in the bumper 2018 draft crop. The tall midfielder was an integral component for the Croweaters throughout their victorious national championship campaign. Hately entered the year as a likely first-round prospect after collecting 27 disposals, six marks, two tackles and four inside 50s in his state’s win over the Allies last year as a 16 year-old. Since then, his performances for both South Australia and at senior South Australian National Football League (SANFL) level with Central District, has seen him maintain and perhaps even increase his reputation amongst draft watchers. Hately has consistently proven across each level that he is a prolific ball winner who is clean at ground level and precise with his distribution by hand. However, by foot Hately can be inconsistent when under pressure, which is an improvement he can make to his game. Regardless, Hately is deservedly ranked in the top echelon of this years midfielder pool. Those who have watched him often will recognise Jackson Hately’s is arguably the drafts best pure inside midfielder, with his ability to find the football for South Australia earning him selection in the All-Australian side. In a star-studded on-ball brigade, the Trinity College student averaged 22.5 disposals, four marks and 6.8 tackles at the mid-year National Championships. The midfielder also managed 12 senior SANFL games this season, easily holding his spot in the Central Districts lineup. In those games, Hately kicked 11 goals (including a three-goal outing against West Adelaide in April) – highlighting his impressive scoreboard impact – and was named in the best on three occasions. This senior football exposure will no-doubt appeal to clubs. A member of the AFL Academy, Hately collected 17 disposals, eight tackles and, importantly, kicked two goals against the North Melbourne VFL side earlier in the year. Jackson Hately’s size is a genuine physical asset for the South Australian. At 192cm, the Central District product is able to play as that tall, contested ball winning beast on the inside of a midfield unit. However he also possesses the capacity to be deployed as a third-tall forward where his overhead marking strength can be a weapon. At 80kg, Hately still has some weight to add to his frame, which will be easily done at AFL level. Aerobically, Hately’s sound endurance base allows him to spread well, cover the ground with relative ease and accumulate the ball across four quarters – a rare trait for a draftee. Along with his size, consistency and production, Hately’s cleanness, stoppage nous and distribution by hand makes him a real in-and-under threat to opposition midfields. His ability to dish out smart, effective handballs is not unlike that of Fremantle star and fellow South Australian Lachie Neale. He has been ultra-consistent this season in the SANFL and one of the big reasons Central District won multiple matches. Unlike many 18-year-old draft prospects, Jackson Hately does not need to further his endurance base, however there are a couple of areas where improvement may be required. Whilst he is a terrific accumulator of the football, both in the contest and around the ground, Hately at times could have more impact with his possessions. This can partially be attributed to his kicking, which can be hot and cold. His foot skills are fine for the role he plays, however it will unlikely ever be a strength. His long kicking can be impressive at times, but when under pressure kicking out of a contest he can sometimes rush it onto the boot. It is another reason why he has become so effective using his hands in traffic. Hately will appeal to clubs picking anywhere from seven to 15 looking for a ready-made midfield workhorse who can step straight into an AFL side next season, due to his aerobic capacity and tall frame. Whilst he looks set to spend most of his career as an inside midfielder, Hately’s versatility could see him utilised across half-forward or in a more outside-leaning role early on. Having already played against men in the SANFL, Hately appears to be a relatively safe selection- one who is highly likely to notch up 200 plus games as an integral part of an on-ball unit.